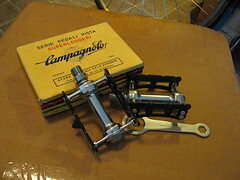 These were pedals I got for cheap at Interbike a couple of years ago. They’re so so, I’ve unclipped from them more times than I ever did with my old SPD PD515’s. (This post is reminding me a bit of a museum I just got linked to from Bike Hugger. My own little pedal museum of sorts.) After these problematic Candies, I came into ownership of some Campy cages that are a bit too long for the ultra-tight geometry of my road bike—finding medium clips for these pedals is proving difficult. But that’s not all this post is about… wait, there’s more. Just yesterday, a few visitors came into the shop and introduced us to some pretty rad accents for these sweet pedals, among other things, check these out. How nice is that red leather going to look on those black toe-clips? When I get around to sewing them up I’ll have some more pictures to share. The same dude also makes a really subtle and classy looking top tube cover. To the three of you that came into the shop, Hugo, Timmy, and Yohei, thanks! Hope to see you down at NAHBS, keep an eye out Sunday! Today’s Word of the Day (or here). 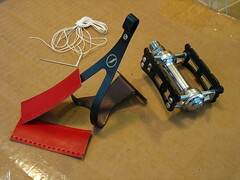 The ubiquitous MKS track pedal. They’re nice, they work, they’re fun (and sometimes necessary) to rebuild. Are they my “Spirit of the Woods”? Not really sure…. Maybe I’d feel more mythical were I riding Custom Nuevo’s, but that’s another story. 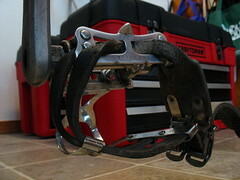 As an aside, those are Soma four-gate clips (available at the shop) with double-straps, they work pretty well and are pretty affordable too. 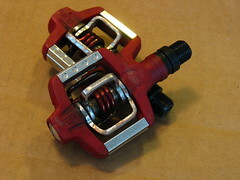 How many people out there are using these pedals do you think? I’ve seen criticism of their ubiquity online. But I guess the purpose of this post is really to question why they have “Sylvan” on them? Anyone know? I believe their inspiration had something else written on them: nice gallery images here.